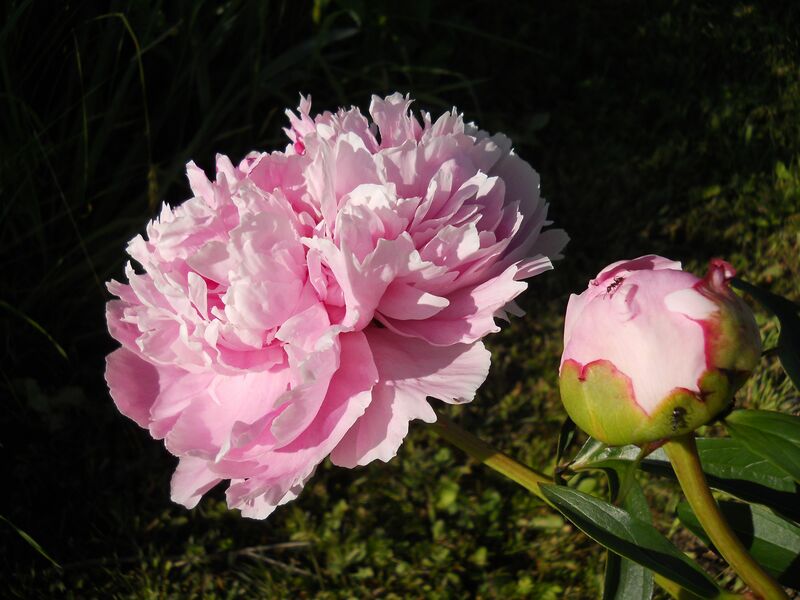 I’m up with the first chirps of the birds at 4:15, my peony bush I planted as a root five (or is it six?) years finally has blossoms which are the size of small dinner plates, and and the days are long, long, long. Yes, it is June. A month I wait for 12 months, when the fields have their deep, rich, sweet smells you can’t find anywhere else, the birds have a symphony all day long, and the crops are starting to come in. The deep darkness of January is a faint memory. Saturdays tend to be the day I do all my food shopping, so the evening meals are extra special; a lot more time to cook than during the week and sometimes the meals are a bit more complicated. This Saturday I knew what I wanted to make. Several months ago I had made a beef stew in the crock pot and the accompaniment was spaetzle, the German version of dumplings or Italian pasta. My Eastern European roots were showing, these were easy to make, you have to work fast with the boiling water, but oh, they were delicious. All spring I’d been thinking of them and wanting to make them a bit more special. With fresh chives and thyme in the herb garden, I decided to add the herbs to the dish, but with just a simple dressing of a little bit of olive oil and freshly grated cheese. 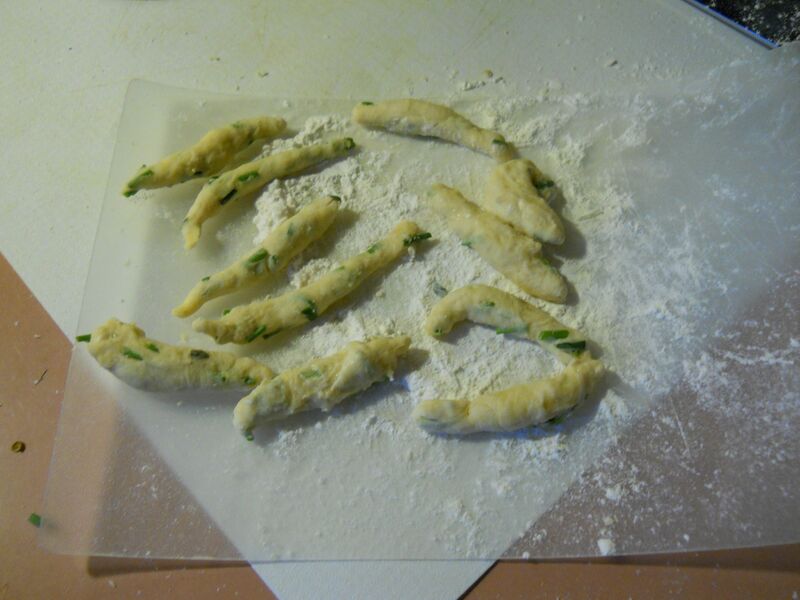 Homemade dumplings aren’t really difficult to make, it’s just a bit on the messy side. In a bowl, add a cup of flour and some salt, about ½ teaspoon or so. Whisk together, add an egg and a little bit of water or milk and mix until all is incorporated. That’s it! I added about a teaspoon of chopped thyme and 2 tablespoons of chives and mixed it together. Cover the bowl with plastic wrap and leave it on the counter for 45 minutes or so. Now comes the messy part. Fill a Dutch oven with water and bring to a boil. While this is happening, I divide the pasta into thirds. With flour-covered hands, I pull off a little bit and roll into thin strips and just keep doing this. Mind you, when they boil they turn into short stubby fingers, but you can always play around with the shapes. 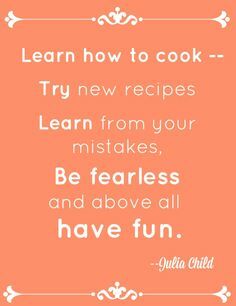 (This is my method, but the instructions for the recipe this is derived from has a much easier method. And from the looks of it, a much cleaner one, too!) When I have a batch ready to go, I pop them into the boiling water, and just wait until they come to the top. That’s when you know they’re done. With a slotted spoon, add the dumplings to a large bowl, and just repeat the steps until you’re done. I was thinking a quick and simple red sauce would go well with this, too. Or adding some chopped fresh spinach and maybe some early garlic. The possibilities are endless! Recipe adapted from Beth Hensperger’s recipe for spaetzle dumplings in the cookbook, Not Your Mother’s Slow Cooker Recipes for Two, Harvard Common Press, 2007. 1. In a medium size bowl, combine the flour and salt. Make a well in the middle and add the egg and milk in the center. Blend well with a wooden spoon until evenly moistened; the dough will be very thick and moist. Cover with plastic wrap and allow to rest at room temperature for 45 minutes. 2. Bring a large stockpot of salted water to a rapid boil. If shaping by hand, place the dough on a wet cutting board and rest it on the rim of the pot. Using a damp paring knife or soup spoon, cut off little irregular portions of the width of a pencil and about 1/2 inch long at the edge of the board and let them fall into the boiling water. If using a spaetzle maker, position it over the boiling water; it will rest on the rim of the pot. Place the dough in the hopper and slide the carriage back and forth, dropping pear-shaped bits of dough into the water. 3. 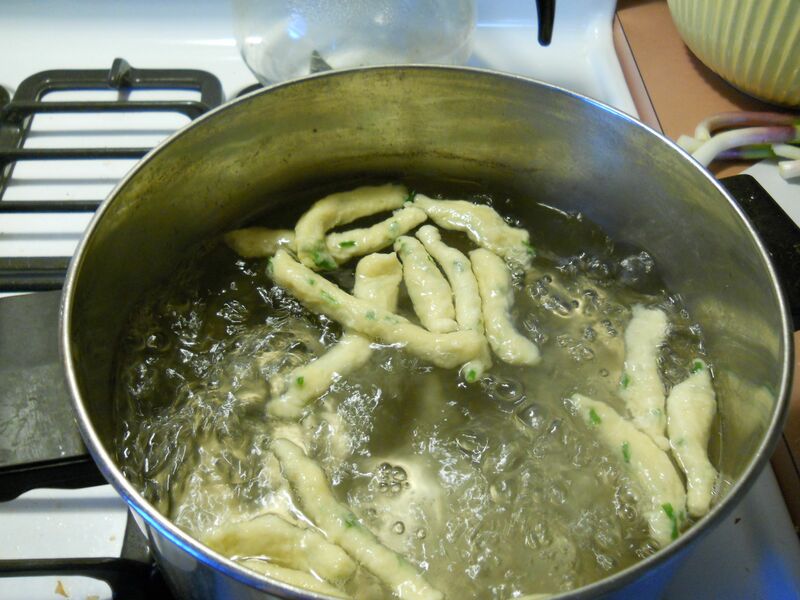 Simmer the spaetzle, uncovered, until they float back up to the surface, about 30 seconds. Remove with a fine-mesh strainer or slotted spoon, shake off the excess water, and place in a shallow casserole. Toss with the unsalted butter (or olive oil) and a dab of sour cream (if using) to keep them from sticking together. Serve immediately as a side dish, or cover and refrigerate for up to 8 hours. Reheat for 12 to 15 minutes in a 350 degree oven. Looks delicious! but oh, the work.